BOMAG Americas representatives along with South Carolina state and local government officials held a groundbreaking ceremony yesterday in Ridgeway, S.C., on the future site of the manufacturer’s new North American headquarters. BOMAG Americas, Inc. representatives along with South Carolina state and local government officials held a groundbreaking ceremony yesterday in Ridgeway, S.C., on the future site of the manufacturer’s new North American headquarters. The new 127,600-square-foot facility will house 107,100 square feet of spare parts warehousing and machine assembly area. It will also include with 20,500 square feet of office space. 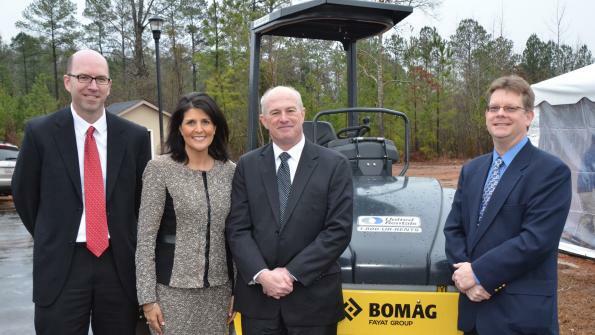 “We congratulate BOMAG on their announcement of an $18.2 million investment and the creation of 121 new jobs,” said South Carolina Gov. Nikki Haley. BOMAG chose the new location — situated within 30 miles from Columbia and 70 miles of Charlotte, NC — to advance product and service support for its customers and distribution network. The new facility ties into the company’s 2013 acquisition of its asphalt paving and reclamation equipment lines. BOMAG looks to begin construction of the new facility in March with an anticipated completion date sometime in October 2014. At that time, the manufacturer will begin the move from its current Kewanee, Ill., headquarters. The new facility’s warehousing area includes dedicated equipment assembly space, where workers will customize the company’s compaction and road building equipment with features designed specifically for the North American market. “We believe this area offers our company several strategic benefits, such as: close to port of entry, proximity to an air hub for spare parts fulfillment and a climate conducive to offering year-round sales and service training for our customers,” said Walter Link, president of BOMAG Americas, Inc.
A global organization, BOMAG manufactures and markets a range of light and heavy compaction, asphalt paving, and soil stabilization and asphalt reclamation equipment. Last year’s acquisition of Cedarapids commercial and mainline pavers and material transfer equipment as well as CMI Reclaimer/Stabilizers expanded its firm’s equipment offering to road building contractors. BOMAG offers customers a range of asphalt rehabilitation and paving equipment, ranging from half-lane milling machines, reclaimer/stabilizers and material transfer equipment to asphalt pavers and highway-class tandem vibratory and pneumatic rollers. Here are scenes from the BOMAG Americas groundbreaking ceremony in S.C.